In my proposal for Taking Tea with the Dead, I wittered on at some length about how fabulously plugged in Indonesia is. The world’s second largest Facebook community, some 18 percent of all Twitter traffic. Jakarta pulsates a glorious crimson on this wonderful Twitter heat map at most times of the day and night. But as Merlyna Lim reminded us in a recent report on democratization and social media in Indonesia (pdf), most of those people live in Java and Bali, with a smattering in large cities in other islands. Since I’ve started my travels far from the mother-lode, I can identify especially with this map, taken from Lim’s report, of telecoms distribution. 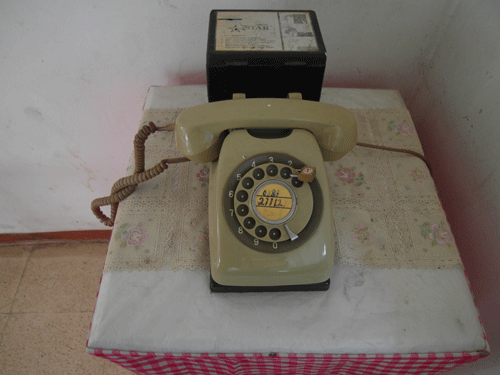 And let’s not forget that that phone pictured above, under lock and key in a Waikabubak guest house, counts as part of the 0.2 percent. I’m hoping some of those open source guys can find a way for us to Tweet by tom-tom. 1 Comment on "Notional Networks: the realities of Indonesian Telecoms"
aftersales is not as fast as the development in big cities. some areas, the operator provider never give any solution. what is happening in this areas. provider signal easily access by the handphone user. even inside a five star hotel (not only around my house). balance with the “after sales service”. Thanks.